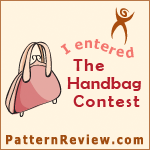 I recently entered a contest on Pattern Review, mostly to try to get back my sewing mojo I seem to have lost. 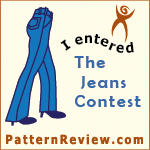 Of course I waited until the last day to enter the contest, to finish the top. After looking at my finished project, I have to admit, I think I did a pretty good job. For one thing, I finally figured out how to use the automatic button holer. I've had this sewing machine for over 15 years and had never figured out how to use it. While looking at all my presser machine feet, all of a sudden it just clicked, it was so easy. I also got a chance to use my pintuck presser foot I recently ordered. The result were really amazing. Well enough about that, the top I made was a Butterick 6026. I just love all the detail on the sleeves, sides and top. The only modifications I made were shortening the sleeves, otherwise it was a perfect fit. I can see myself making a sleeveless one for the summer. A few weeks ago I agreed to be a pattern tester for a girl's cross-body bag. I was really excited because I love making bags and the opportunity to test a pattern out for someone else was something I had been looking forward too. I must say, I love it, I love everything about it, the size, all the pockets and the fact that it's a cross-body bag and you have free hands! It's the perfect bag to take when shopping, on vacation, or when you don't want anything weighing you down. The hardest part about making this bag was choosing the fabric, but now that I've made my first one, I can see me making a few in different colors. I've been MIA from the blogging world for awhile. I took a short vacation, (they're never long enough) and and I've been busy trying to talk my husband into helping me with a project I wanted done. Finally, I got him to do it. After replacing our mattress, we found ourselves with an extra mattress that could still be used. Instead of buying a box spring and frame, I wanted to try something I'd seen on several blogs lately. I took down all the instructions for building a bed frame and off to the lumbar yard we went. He used 4 x 4's for the corner posts and cut them to size and painted them black,, he then added wheels, so I could easily move it around by myself ( I know how he thinks, he doesn't want to be bothered). I didn't take a picture of him attaching the corner posts because I actually had to help him with the process, but he basically drilled a hole through 2x6 and counter sunk the screw. I also had to help him attach the brackets for the 2x4's that we used as slats, then you lay OSB over the 2x4 (this is optional), and you're done. Well... almost. I covered the 2 x 6's with burlap, then I added the mattress and matching comforter. I'm still debating what to do for a headboard, I'm thinking of covering something in pleather or micro suede and hanging it or attaching it to the bed frame. But for now this is will have to do! I was browsing the internet, looking for inspiration for summer apparel when I came across this tutorial for a J. Crew inspired skirt (http://www.mygrowinghome.com), I thought it was a cute skirt and really simple, it didn't require a lot of fabric or time. I happened to have just enough fabric in my stash to make this skirt. I don't know if you can tell by the picture, but the elastic doesn't go all the around the skirt, the elastic is attached about 1 1/2" from the edge of the skirt. I was skeptical about this, but went ahead and followed the directions. After trying on the skirt, I think it was a great idea, it keeps the fabric from bunching up on the sides, making you look like you have wider hips than you actually have and who wants that, right? One thing I would change though, is the pockets, I would either alter them or get rid of them altogether, I found the square pockets kinda useless. All in all I really love the skirt and I can see making a couple more for the summer! When I first saw this top over at Handmade Jane, I knew I had to make one for myself. Being a vintage pattern I thought I would never find it in my size, I've never graded a pattern, so that was out of the question. The pattern is Simplicity 4238, it took awhile, but I finally found it and had it in my hands a few weeks later. I must admit the instructions through me for a loop, I didn't understand how the front band facing went together, so I just fudged my way through it. I think it turned out ok. I plan on making more of these for the summer, maybe it'll become clearer to me after a couple more. Other than that, I really love the top, I love the way it fits, its very casual, but I think the darts, give it a more fitted look, therefore dresses it up a bit. In anticipation for summer, I started working on summer tops. I had a pattern for an split back top, years ago, but when moving I decided to clean house and donated all my "outdated" patterns. Little did I know, I would give anything for them now. But I figured, how hard could it be to split a tee shirt in the back. So I took Butterick 5493 view C and split the back open, I added a little flare and omitted the ruffle in the front. As usual, I did a rolled hem, I love this feature on my serger, it's so easy to do and looks nice and neat. I can't wait for a hot day to wear this top! So what do you do when you're snowed in? Work on projects. I've been wanting to make a peplum top, but I have no pattern, so I searched the internet for free patterns. I found a few tutorials, but they weren't very clear, as least not to me. So, I did what I always do, I winged it (wung it?, wanat it? ), whatever! I made it up as I went along. I didn't have enough fabric to cut the peplum on the bias, so I tried to match up the plaid, as you can see, that didn't turn out to good. I also I used the pattern for the blank canvas tee and made my own peplum, but I couldn't figure out how big to make it, so I just made it as big around at the natural waist line and flair out like an A-line skirt. I think I should've made it a tad bigger around the waist, but then I didn't want gathers. I think I'll look for better instructions on how to do that and if the snow doesn't clear soon, guess what I'll be doing? I created this blog in order to document my journey in sewing, my adventures, my mishaps and learning and sharing from other like minded people, please join me in my adventure!